Wildcards existed long before September 18, 2008 and the airing of the It’s Always Sunny in Philadelphia episode “The Gang Solves the Gas Crisis.” Yet I think it’s fair to say the role of the wildcard, their place in both our culture and our social situations, was never as clearly defined and presented as it was by that episode, in which Charlie’s role as the wildcard was established. Was Charlie Kelly the original wildcard? No. But has he become the symbol of the wildcard? Oh you betcha. What exactly is a wildcard? And no, not a wildcard in cards or a wildcard in terms of the playoffs in baseball and football. We’re talking about the wildcard- the person and/or thing that plays the role of wildcard. “A person who is generally unpredictable and has no defined role in a group of friends, and their often reckless and wacky behavior can either benefit or hurt the group depending on the situation. Okay, that’s a decent enough definition. Not sure I 100% agree, though. Now that is a definition of a wildcard…or sorry, wild card, I agree with. The wild card is unpredictable and when a wild card is involved, the general feeling is that because of that inclusion, anything can happen. And that anything can be good or bad, fun or terrible, wonderful or a complete disaster. You never know- that’s why they are called the wild card. As a person, you never know where the wild card will show up, you never know what the wild card will do next. As a thing, you never know how you’ll respond to the introduction of a wild card into a situation or how the application of a wild card will alter the course of your day. Bottom line- person or a thing- when it comes to the wild card, you just never know what’s going to happen. So if Charlie is on the wild card flag, who or what is out there waving the flag? Who are the wild cards out there roaming our streets making life more interesting, for better or worse? And most importantly, who is the wildest of the wild cards out there today? 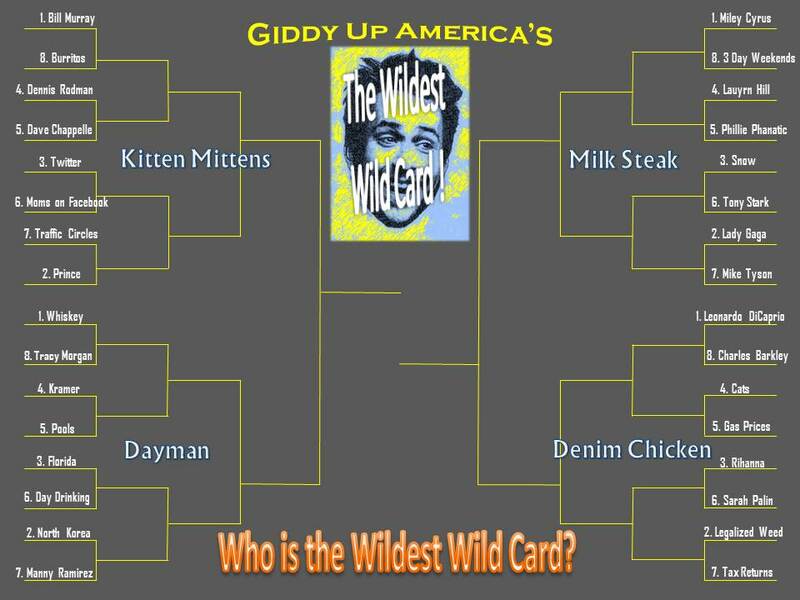 That is what Giddy Up America intends to find out…who is the wildest wild card? It’s March, let’s figure this one out March Madness style. Right off the bat- who is eligible? 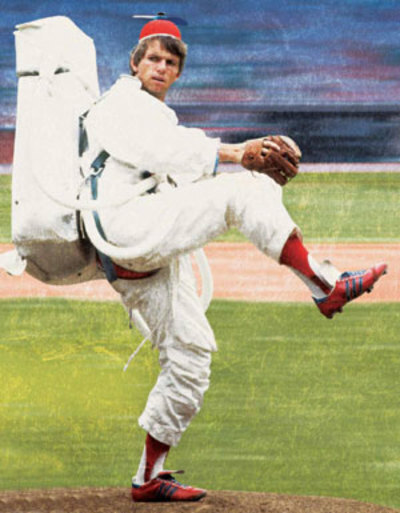 The wild card in question, whether it’s a person or a thing, must currently be serving as wild card and/or have left such a lasting a legacy that in true wild card fashion, their presence is still felt. So who is in the mix here? Well we have a group of 32 consisting of both people and things, all of which are currently out in the world, being wild cards. No debate there. Murray is almost the definition of a wild card and if not for his continued wild card antics, he’d surely be among the greats in the Wild Card of Hall of Fame. But you can’t enshrine a guy who seems to still have so much left in the tank. So it all starts with him, our overall number one seed. The other number one seeds are Leonardo DiCaprio, whiskey and Miley Cyrus. Each number one resides in their own bracket and each bracket is named after a Charlie-ism. If you’re not familiar with them, then I strongly suggest you get to watching It’s Always Sunny in Philadelphia. Who wins each match-up will not be determined in any particular or methodical fashion because that’s not how a wild card would run this thing and we need to honor the spirit of this tournament. I am open to feedback, opinions and insight. But for the most part match-ups will be decided by illogical arguments, points, statements and facts that might not even be facts. Bill Murray is going to be tough to beat. He’s the Michigan State of the tournament- a tough out with a legendary track record. Look out for Moms on Facebook- they’re bound to say or do anything and just as likely to embarrass you in the process. Should whiskey be replaced by tequila? No. Tequila is not a wild card. Tequila is just dangerous. Kramer is in the tournament because not only does his legacy as the Crazy Neighbor live on, but so do episodes of Seinfeld. The power of syndication keeps the spirit of the K Man alive and well and relevant. Does a Elite Eight contest between Leo and RiRi put their relationship in danger? I guess we’ll have to find out. Cats. They’ll either dominate the tournament or get distracted by a discarded sock. Hard to predict.